Monoclonal antibodies represent therapeutics of great conditions such as cancer, inflammatory disease, organ transplantation, cardiovascular disease, infection, respiratory disease and even ophthalmologic disease. Monoclonal antibodies have also been widely used in biological research and in-vitro diagnosis (IVD) for over 40 years. Köhler and Milstein1 were the first to generate a monoclonal antibody in mice in 1975 using the hybridoma technique when they fused single B-cells from the spleen of a mouse to myeloma (cancer) cell line. At the end of the engineering process, the recombinant antibody needs to be tested against the target for validation. The XelPleXTM system from HORIBA Scientific is a perfect tool for this validation step. This technology belongs to a new generation of label-free interaction analysis platforms and is capable of accurate affinity determination in a multiplex mode. A monoclonal antibody developed at SYnabs SA (Belgium) by a new hybridoma technology for Guinea pig monoclonal antibody has been rescued and produced by Diaclone. That monoclonal antibody was highly specific to a steroid hormone (undisclosed) of 290 Da molecular weight and was analyzed using the XelPleXTM system. The affinity of the hormone / antibody model, as well as the limit of detection of the hormone, was determined. Thanks to the array-based format of the SPRi sensor chips, it is easy to extend these results to multiple interactions and to quickly integrate the XelPleXTM system into the validation of rescued recombinant monoclonal antibodies from Diaclone. As seen in Figure 1, the 3rst steps of the Mab development process are immunization, followed by cell fusion, and then cell cloning to obtain monoclonal clones by limited dilution. The rescue step begins by performing molecular biology experimentations: cell pellets from a hybridoma Mab candidate is used to obtain Heavy (VH) and Light (VL) nucleotide sequences. The VL and VH sequences are then sub-cloned in expression vectors which are used for transient transfection in mammalian cells to produce the recombinant antibody. After 14 days of production, the antibody is puri ed by af nity chromatography. 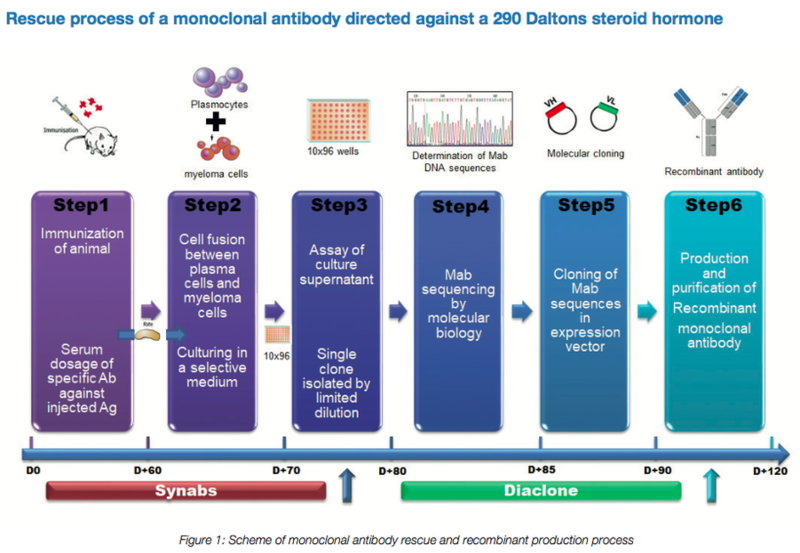 Among recombinant monoclonal antibodies rescued by Diaclone according to the process described above, one well-characterized antibody binds speci cally to a 290 Daltons steroid hormone. Thanks to the XelPleXTM system (based on SPRi technology), this was evaluated. density. It is activated using an EDC/NHS solution in preparation for amine coupling. Prior to the immobilization process, the antibody of interest was prepared at a concentration of 0.7 μM in 10 mM sodium acetate at pH4.0 and at pH5.0. These antibody preparations were used to immobilize the antibody on the SPRi- BiochipTM-activated surface using the SPRi-Continuous Flow Microspotter (SPRi-CFM). The SPRi-CFM uses continuous ow deposition to immobilize up to 48 molecules in a single printing run. Three printing runs can be performed on a single biochip (and up to 144 spots per chip can be generated). The micro uidic immobilization improves the spot homogeneity and gives a higher immobilization level. For this experiment, the ow rate oftheSPRi-CFMwassetto15μL/minandthecontacttime to 30 minutes. prepared at 0.7 μM in 10 mM sodium acetate at pH4.0, to check for chip reactivity. Each antibody was immobilized in triplicates (Figure 2). After the immobilization procedure, the SPRi-BiochipTM was blocked using 1 M ethanolamine. 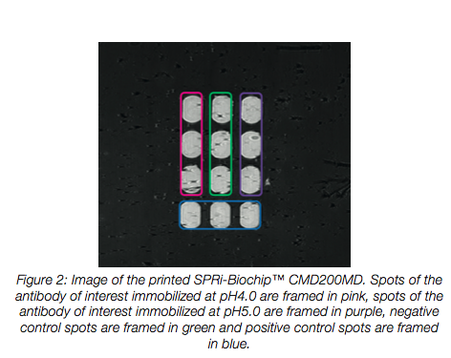 The SPRi-Biochip™ CH-LD is made of a self-assembled monolayer of polyoxyde ethylene glycol. A low density (LD) of reactive polyoxyde ethylene glycol is mixed together with non-reactive polyoxide ethylene glycol. The SPRi-Biochip™ CH-LD was activated using an EDC/sulfo-NHS solution in preparation for amine coupling. 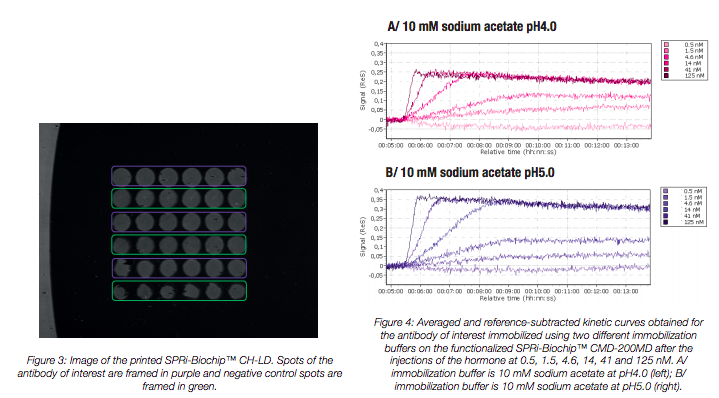 The antibody of interest and a negative control antibody (prepared in 10 mM sodium acetate at pH 5.0) were immobilized in replicates on the SPRi-Biochip™-activated surface at a concentration of 7 µM using the SPRi-Arrayer™ (Figure 3). The SPRi-Arrayer™ is an automatic and compact system used in the HORIBA Scientific SPRi platform for immobilizing ligands in a multiplex format onto a SPRi-Biochip™ or a SPRislide™. This versatile instrument uses direct contact spotting and is suitable for printing on bare or 2D-functionalized SPRiBiochips™ or SPRi-Slides™. Contact spotting allows for fast and flexible microarray printings. The diameter of the printing pin can be adapted to the number of required spots in the matrix. Here, the diameter of the printing pin was 500 µm. After the immobilization procedure, the SPRi-Biochip™ was blocked using 1 M ethanolamine. The printed SPRi-Biochip™ was loaded into the XelPleXTM system. The interactions were monitored using EzSuite software. The running buffer was 10 mM PBS pH 7.4 and the working temperature was set to 25°C. Then, 200 µL of the hormone were injected into the fluidic system at a flow rate of 50 µL/min. The hormone was injected at six increasing concentrations, following a threefold dilution series: 0.5, 1.5, 4.6, 14, 41 and 125 nM. A regeneration cycle was performed between each hormone injection by flowing a 0.1 M glycine-HCl pH2.0 solution with a contact time of 30 seconds. The antibody of interest was immobilized using two different immobilization buffers on a single biochip in order to evaluate and select the best immobilization buffer. The large working area of the SPRi-Biochip™ and the multiplexing capabilities of SPRi systems allow for the immobilization of different molecules and/or testing of different immobilization conditions on a single biochip. Figure 4 compares the averaged and reference-subtracted kinetic curves obtained for the antibody of interest immobilized using 10 mM sodium acetate buffer at pH 4.0 and at pH 5.0. Specific binding monitoring was observed for the antibody of interest while injecting the hormone at different concentrations for the two immobilization buffer pH levels. Specific hormone binding responses retained on the spots of the antibody of interest are represented in Figure 5. For each injected concentration, the specific binding responses were measured during the dissociation phase of hormone injections at the same time point. Values are reference-subtracted and spot-averaged. The unique binding of a monoclonal antibody characterizes its specificity. Figure 6 compares averaged and referencesubtracted kinetic curves obtained for the antibody of interest immobilized using 10 mM sodium acetate buffer at pH5.0 after the injections of the hormone and a structural analogue. Both molecules were injected at the same concentrations following a three-fold dilution series (from 125 to 0.5 nM). ü The optimal immobilization buffer pH for the antibody of interest is pH5.0. ü The limit of detection of the hormone is 1.5 nM (~ 0.45 ng/mL). ü The saturation level is reached at 14 nM (same signal observed for higher concentrations). A regeneration step was performed between each molecule injection using 0.1 M glycine-HCl pH2.0 solution with a contact time of 30 seconds. Specific binding responses were observed for the antibody of interest while injecting the hormone at different concentrations, whereas no binding response was observed while injecting the analogue at the same concentrations. From this, it can be concluded that the antibody of interest is specific to the 290 Daltons steroid hormone. Figure 8 compares averaged and reference-subtracted kinetic curves obtained for the antibody of interest immobilized using the SPRi-CFM on a SPRi-BiochipTM CMD-200MD and the SPRi-ArrayerTM on a SPRi-BiochipTM CH-LD. 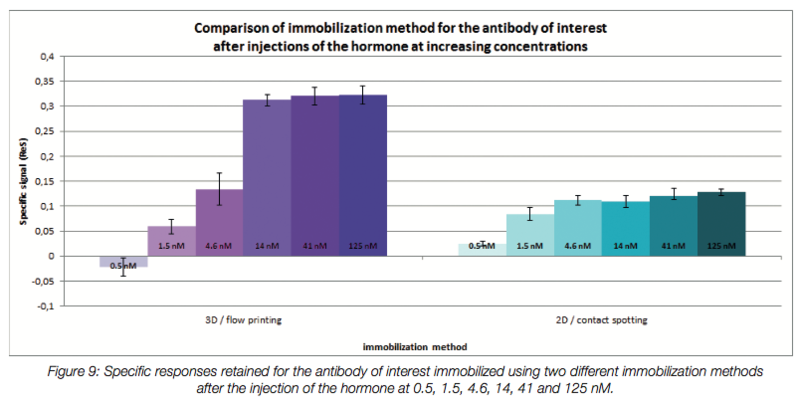 Specific binding monitoring was observed for the antibody of interest while injecting the hormone at different concentrations for the two immobilization methods. 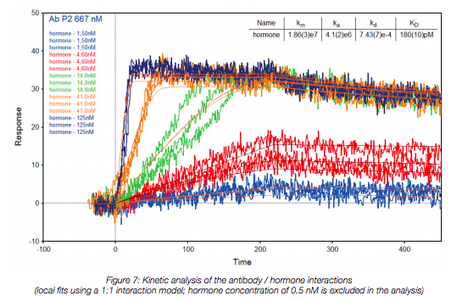 Specific hormone binding responses retained on the spots of the antibody of interest are represented in Figure 9. For each injected concentration, the specific binding responses were measured during the dissociation phase of hormone injections at the same time point. Values are reference subtracted and spot-averaged. Binding responses obtained were about 3 times higher for the flow printing on 3D chemistry than for the contact spotting on 2D surface chemistry for the 3 highest concentrations of the hormone injected. However, using contact spotting and 2D surface chemistry, the limit of detection of the hormone is 1.5 nM (~ 0.45 ng/mL). The saturation level in the case of the contact spotting on 2D surface chemistry is reached at 4.6 nM. These results are correlated with the features of 3D chemistry since a hydrogel consists of a network of reactive groups, increasing the immobilization amount capacity and consequently the binding amount capacity without any steric hindrance issue. The kinetic curves obtained in the case of contact spotting on 2D surface chemistry were analyzed using the EzFit software. The curves profile was linear, similar to the flow printing on 3D chemistry. However, a successful fit wasn’t possible by integrating the mass transport limitation option. This is probably because of the low binding responses obtained in these conditions. A recombinant monoclonal antibody rescued by Diaclone using molecular biology was evaluated using the new labelfree interaction analysis platform from HORIBA Scientific, the XelPleXTM system. This antibody binds specifically to a 290 Daltons steroid, a low molecular weight molecule. The limit of detection of the hormone was determined to be ~ 1.5 nM (~ 0.45 ng/mL). This limit of detection was obtained with a flow printing of the antibody on 3D chemistry as well as with a contact spotting technique on 2D surface. A low molecular weight molecule is very challenging to analyze with “contact spotting / 2D surface chemistry”, but the antibody of interest specific to the hormone showed that the detection of a 290 Daltons molecule is possible with this combination. This confirms that the produced antibody is of high quality. The specificity of the antibody was also verified by flowing an analogue hormone at the same concentrations. No binding response was observed with the antibody of interest while injecting the analogue hormone in the XelPleXTM system. The kinetic curves profile showed mass transport limited kinetics. An affinity of 0.2 nM for the hormone / antibody interaction was calculated with this mass transport effect taken into account in the EzFit software by the addition of a km constant. The XelPleXTM system performed well and it allowed for a complete analysis of the antibody of interest. Thanks to the array-based format of the SPRi sensor chips, the XelPleXTM system can easily extend its performance to multiple interactions and quickly integrate into biomolecule production processes such as Diaclone’s monoclonal antibodies production process at the validation step.